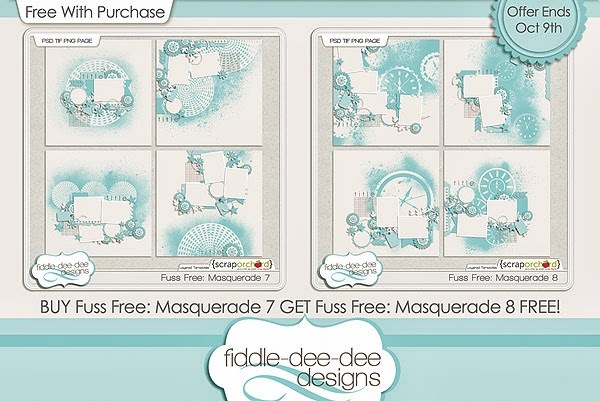 Fiddle-Dee-Dee Designs: Fuss Free: Masquerade 7 & 8 and FREE With Purchase Offer! Fuss Free: Masquerade 7 & 8 and FREE With Purchase Offer! I'm enamoured with the spraying, misting and masking that can be done on paper. I wanted to recreate the same look for my digital layouts, so I designed Fuss Free: Masquerade 7 & Fuss Free: Masquerade 8. The backgrounds are covered with lots of sprays and mists with graphs and clocks masked out of the spray. Clip paper to these misted masks or simply recolor to add a unique hand-crafted look to your pages. October is here and so is our new challenge format. The 10 challenges for this month have already been posted in The Challenges forum, so you have all month to complete them. 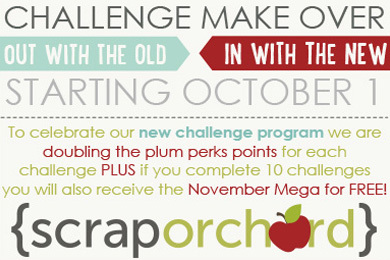 Remember that for the month of October, we will be doubling the Plum Perks Points so you can earn up to $4.60 in store credit just for completing the challenges. And if you complete all 10 challenges, you will also get the November Mega for FREE! One of the big challenge changes is that there is only one template challenge. It's now called Template Tuesday Challenge. You can choose from three templates that were posted on the Scrap Orchard blog during the month of September (one from me, from from Liz/Scrapping With Liz and one from Andrea/Little Green Frog). This is the template that I posted for Template Tuesday in September. You can click on the image to go directly to the blog to download this template. If you want to participate in the challenge, go to the Template Tuesday Challenge #ttchallenge in the forum to get all the details. This is the second month that I have a free template over on the My Scrapbook Art Blog for their monthly template challenge. Click on the image to go the My Scrapbook Art Blog to find out about getting this template for free! And I also have a new template that you can download for FREE just for being a fan of my Fiddle-Dee-Dee Designs Facebook Page! Feeling very thankful this weekend for my family and friends ~ hope you are enjoying yours as well ~ making memories and documenting them!